Flooded road, Burgh by Sands, Cumbria. It’s been many days rain now, and the flooding here has made national news. Tractors are pulling out school buses, and people are abandoning their cars on the higher ground. Despite all the vehicular chaos, I can still make good forward progress wading through on foot. A friendly farmer offers me a ride across a flooded track in his tractor. Always a bit tricky to explain why I can’t take any help without seeming insane! ‘That’s very kind my feet are already wet’, ‘Ne bother’ he replies. Cast iron road sign by the Solway, Easton, Cumbria. Solway Firth in rain from Bowness-on-Solway, Cumbria. Silted-up canal and derelict quay at Port Carlisle, Cumbria. Solway Firth from Port Carlisle, Cumbria. Following the route of Hadrian’s Wall to Burgh by Sands, Cumbria. WW2 range lookout I, Burgh Marsh, Cumbria. Note the thickness of the roof and walls! WW2 range lookout II, Burgh Marsh, Cumbria. WW2 range lookout III, Burgh Marsh, Cumbria. Miserable though it is, I was happy to be out of the wind and rain for a moment. The River Eden near Beaumont, Cumbria. I’m driven by rage today as I’m so fatigued and there are so many obstacles to contend with one after the other. Most of the day is a struggle through thick mud or wading through flooded fields and roads or climbing over barbed wire fences to avoid the worst patches. A voice in my head begs me to stop and rest all the time. 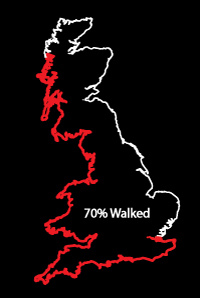 Feet wet, sore knees, pack feeling heavy, no inspiration, hungry & tired….but Scotland is close! The Eccles cakes in my bag have become sodden and melded with slices of ham but, as the last food I’m carrying, I gobble it up greedily. Hadrian’s Wall path in flood, Kirkandrews-on-Eden, Cumbria. It’s rained for seven hours and then suddenly the sky is blue and warm. It lasts half an hour before the downpour continues. Much flood debris is carried down the swollen river Eden at speed. The earthwork of Hadrian’s wall becomes more and more apparent as I approach Carlisle. A skein of geese ribbons above my head as the sun sets purple. Hadrian’s Wall Path, Kirkandrews-on-Eden, Cumbria. Near the Start/End of Hadrian’s Wall Path Bowness-on-Solway, Cumbria. I was soaked to the underpants today and my gear didn’t fair much better. This is a dry sack containing a powerecell that leaked due to the seam sealing delaminating. Interesting pictures. I enjoy reading the longer comments too. A bit too wet really! Oh my gosh – did you camp that night? no I didn’t everything was soaked through! Need to add … the sense of place came across really well!! Hope the weather ameliorates for you. Thanks, Burgh Marsh seems pretty bleak at the best of times. What a place for a king to die! Blimey! Talk about suffering for your art! Well done for not giving up. I agree with you and by the time I got to the visible earthworks of Hadrian’s Wall on the approach to Carlisle, it was getting dark! The mud stained my feet for a few weeks. Didn’t wash out around the toes! We, too, have enjoyed your commentary rounding out the stunning photography. I love the irony of a place called Beaumont and a river called Eden in those appalling weather conditions. Glad the waterproof housing on the camera is made of stern stuff! yes, it is ironic, isn’t it! the gasket between eth lens and body is very fragile and I had a disaster when heavy rain got in through a tiny tear down on the south coast. I check it regularly now! Wow! Thats perseverance…. Bravo for keeping on! Thank you for your pictures and for your stories! They are both terrific!